Crown Resorts for the right to develop Queensland's next casino. Queensland Premier Annastacia Palaszczuk informed the bidders of the Government's decision on Monday evening following a Cabinet meeting before publicly announcing Echo's Destination Brisbane Consortium had won the bid. Echo's proposal includes 2,500 new apartments; a Sky Deck, with restaurants and bars (fully accessible to the public); five hotels — including three six-star hotels, fifty restaurants and bars; a new River Arena and a moonlight cinema. A new cross-river bridge would link Brisbane’s Botanic Gardens to South Bank. Ms Palaszczuk said the amount of public space also helped Echo get over the line. “The consortium was able to demonstrate to government that they were ready to proceed,” Ms Palaszczuk said. Property Flythrough from Echo Entertainment Group on Vimeo. comprises Echo Entertainment Group, Far East Consortium and Chow Tai Fook Enterprises. Echo has been widely tipped to win the competition with Crown's bid relying on buying up poker machine licences from Queensland clubs and pubs, a move opposed by the clubs' representative body Clubs' Queensland. Echo also committed to moving its headquarters from Sydney to Brisbane if it won its bid. Construction is due to begin in 2017 and is expected to take between six and 10 years. The future of two regional casino licences, one at Yorkeys Knob near Cairns and one on the Gold Coast, are yet to be decided. Echo Entertainment Group Managing Director and Chief Executive, Matt Bekier, described the DBC approach as a “whole-of-precinct vision”. 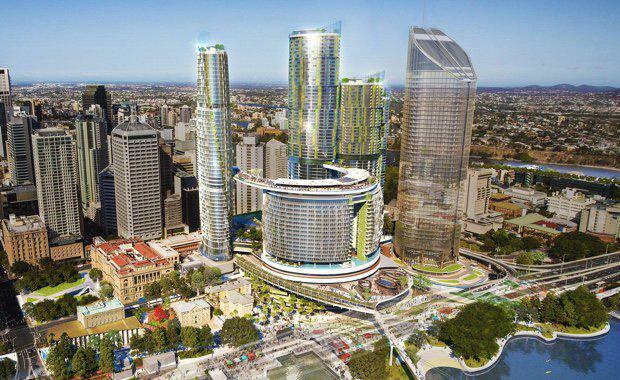 “By relocating the existing casino, and transforming Brisbane’s heritage Treasury Casino buildings into a premium shopping experience and a new six-star Ritz-Carlton Hotel, DBC’s proposal connects and activates the whole precinct with Southbank, Queen Street Mall and the CBD,” he said. “By using the whole precinct, we have been able to provide real connectivity to the rest of the city, making sure that this really becomes the new heart of the CBD. And of course Destination Brisbane Consortium’s scheme does not require an additional casino in the precinct,” Bekier said. He said Queensland is the “absolute, unequivocal priority” for Echo. “Echo Entertainment Group will have more business and more staff in Queensland than anywhere else in the world when Queen’s Wharf opens. We have very significant equity in this development – real skin," he said.